Sandisk on Monday introduced the world’s largest microSD card, at 128GB, ensuring you’ll never have to worry about storage issues again. The tiny little memory card is barely the size of a fingernail, but introduces unfathomable storage with faster write speeds, at 10Mbps. The largest microSD card previously available was 64GB, so Sandisk’s newest creation doubles that storage. This is being directly designed to work in your Android smartphone or tablet, meaning you’ll be able to carry around plenty of movies, music and pictures wherever you go. The design is exactly like other microSD cards; Sandisk just managed to cram more storage inside of it. Sandisk said its latest breakthrough allowed the company to increase the storage of microSD cards by 1,000x in less than a decade; the company used a new proprietary technique that “allows for 16 memory die to be vertically stacked, each shaved to be thinner than a strand pf hair.” Of course, that big breakthrough in storage space comes at a cast. The new 128GB card—which should give you about 16 hours of full HD video, 7,500 songs, 3,200 photos and more than 125 apps—will go for $199.99. That’s essentially the price of a subsidized phone. With most content living in the cloud today, a 128GB card might not be necessary, but it sure is a nice option if you want your phone to carry around absolutely everything in your library. In addition the company’s latest microSD card, Sandisk also released a new version of its Memory Zone app, which allows users to view, access and backup all their files. There’s also something called OptiMem, a feature that Sandisk says will enhance your phone’s internal memory. Ideal for Today’s Smartphone and Tablet Users Designed for Android™ smartphones and tablets, the new SanDisk Ultra microSDXC card provides consumers the highest storage capacity available in a removable form factor. Ideal for shooting Full HD video and high-quality pictures, the 128GB SanDisk Ultra microSDXC card delivers twice the speed of ordinary microSD memory cards3 and offers the highest video recording performance available. An Enhanced SanDisk Memory Zone App – Smarter Ways to Organize, Optimize, and Backup Android Smartphones A new version of the SanDisk® Memory Zone app (available on the Google Play™ store in beta) lets users easily view, access, and backup all of their files from their phone’s memory in one convenient place. As a part of the SanDisk Memory Zone app, SanDisk is releasing OptiMem™, a new feature that allows Android users to enhance their phone’s internal memory by automatically transferring some of their old photos and videos to their microSD card4. OptiMem will continuously monitor the user’s mobile device memory levels, and inform them whenever the internal memory falls below a pre-defined threshold. Technological Breakthrough Compared to when the microSD card format was first launched in 2004 with 128MB of capacity, SanDisk has increased storage capacity of microSD cards 1,000 times over in less than a decade with the 128GB SanDisk Ultra microSDXC card. To enable 128GB of storage on a removable microSD card, SanDisk developed an innovative proprietary technique that allows for 16 memory die to be vertically stacked, each shaved to be thinner than a strand of hair. Pricing and Availability The family of SanDisk Ultra microSD memory cards is available worldwide in capacities ranging from 8GB to 128GB with MSRPs of $29.99 to $199.99. 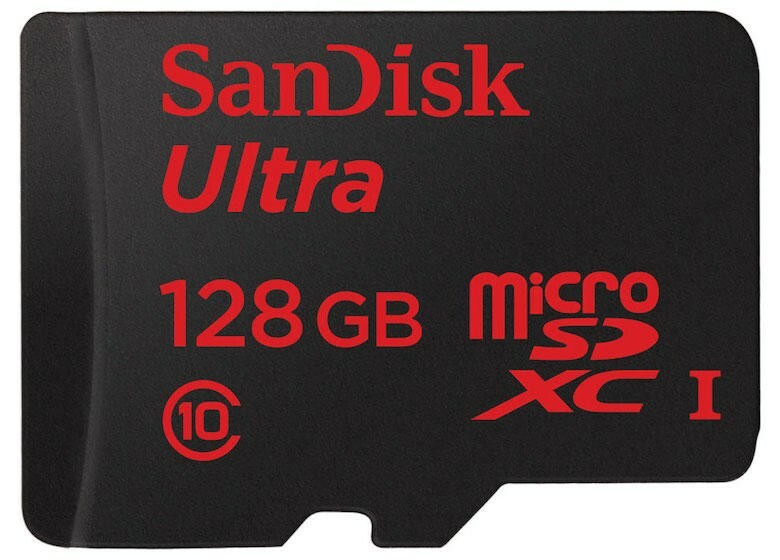 In the U.S., the 128GB SanDisk Ultra microSDXC card is available exclusively at BestBuy.com and Amazon.com. SanDisk at Mobile World Congress SanDisk will be displaying the new 128GB SanDisk Ultra microSDXC memory card in the company’s Mobile World Congress booth, Stand #7A61, located in Hall 7. The company will also be displaying the new iNAND Extreme™ embedded flash drive (announced separately today). About SanDisk SanDisk Corporation (NASDAQ: SNDK), a Fortune 500 and S&P 500 company, is a global leader in flash storage solutions. For more than 25 years, SanDisk has expanded the possibilities of storage, providing trusted and innovative products that have transformed the electronics industry. Today, SanDisk’s quality, state-of-the-art solutions are at the heart of many of the world’s largest data centers, and embedded in advanced smartphones, tablets and PCs. SanDisk’s consumer products are available at hundreds of thousands of retail stores worldwide. For more information, visit www.sandisk.com.